A monthly Welsh language religious periodical serving the children of the Sunday schools of the Congregationalist denomination. The periodical's main contents were religious articles, biographies and general educational articles. Amongst the periodical's editors were David Griffith (1823-1913); David Silyn Evans (Silyn) and Richard Roberts (Gwylfa, 1821-1935). 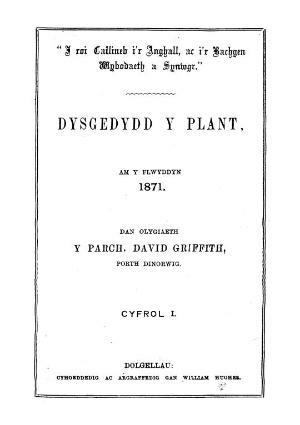 Associated titles: Dysgedydd y Plant a Chydymaith yr Ysgol Sul (1889); Tywysydd y Plant (1933).